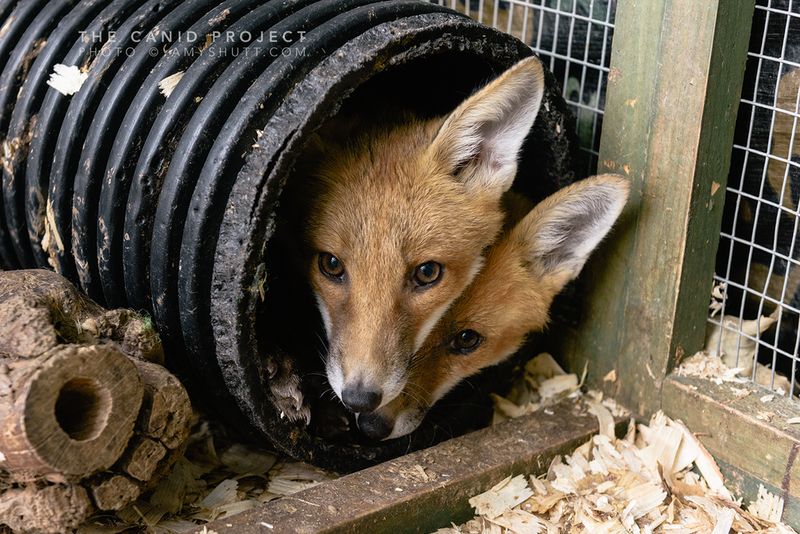 This is the first in our documentary on The Fox Project in the UK. Please be sure to check back for more of the story, pictures, video and more over the next year as we continue this ongoing project. My first trip to England wasn’t to sightsee in London or to visit castles or other historical landmarks, but rather to spend a week with foxes. After 8 hours in the air on a temperate day in May I arrived at Heathrow in London from the USA. My friend Liz offered to pick me up at the airport, thankfully; it was a comforting thought to see a familiar smiling face in a sea of foreign languages and accents. Through text messages I finally located the general area of where she was waiting for me. I stopped, scanned, and finally through the layers of people, I saw her long auburn hair and fair skin with a smile that made me feel relieved. “Hey!” we both exclaimed as we gave each other a warm welcoming hug. I had met Liz earlier that year while co-leading a photographic safari in Kenya’s Maasai Mara. She was a client who became a friend. That week in Africa we just hit it off instantly; we were close in age--both in our 30s at the time—and we both had a similar love of wild animals, dogs, cats, and photography. I do not count many people as close friends, but when I meet someone who has the potential to be one, I know instantly; that’s how it was with Liz—she was definitely a kindred spirit. We wasted no time at the airport; it was early, but she was concerned about the traffic. We loaded my luggage up in her blue Volkswagen SUV and navigated through the busy parking garage. As we exited, the morning sunlight momentarily stung my eyes, which were quite sensitive having been on a dimly lit plane for half a day. I squinted trying to get at least a tiny glimpse of London, as I knew we were heading straight out of the city and for the countryside of Kent. As we entered the motorway, Liz told me all about her garden foxes, which she and her partner had been feeding for a couple of years now. She mentioned how she had to treat some for mange a couple of times, but other than they were a healthy bunch. After the spring cub season the year before she had as many as seven come to her garden for dinner. This isn’t too unusual as a yearly event, because fall is the Red Fox’s dispersal time, when the cubs are old enough to venture out and find their own territories. I suspected she was seeing a few transient foxes. As she told me more stories, I listened intently as I gazed out the window onto the M25 motorway. The lanes and lanes of cars didn’t look all that different from a bad traffic day in Los Angeles; the only thing that felt like the England I had heard of was the gray sky and Liz’s accent. We arrived at the hotel in late morning. Getting there was a blur to me now, partly because I was exhausted and partly because I suffer from horrible jet lag. I tend to exist in a brain fog for a day or two when traveling overseas. We had an early lunch at a pub down the street, and I rested once we returned. I woke to find Liz sitting in a chair by the window reading a book. “Oh no, how long have I been asleep? !” I felt terrible, falling asleep on my friend that way! “Oh, just a few hours, it’s ok, you needed it!” she said in a comforting way. And she was right -- I definitely did. We spent the following day taking pictures and catching up. I was able to see a small portion of the countryside and could tell I’d fall in love with it quickly. That Monday morning after a solid night of sleep, Liz headed home to Swindon, and I hired a driver to take me the 8 miles to The Fox Project. He arrived at half past eight. Houssay was of Indian descent and in his early 50s. In the cab he told me about his experiences over the years with foxes in his own garden. He looked at me through the rear view mirror and stated matter-of-factly, “I see a dead fox almost every day on the road, often more than one”. And I knew he wasn’t exaggerating, because I had read that cars were the urban fox’s main source of mortality. This was only confirmed later in the week as we received several calls to report injured foxes hit by cars. As we drove through the canopied hedgerows on narrow cobblestone streets on the way to The Fox Project, I recognized how magical this place seemed to be. I’d never seen anything like it. I was too accustomed to the newness of America, and this place was a thing of fairy tales to me. The old estates overlooking acres of pastures were like the paintings in my Art History books in college. Soon, the estates were replaced with rolling hills and forests with dabbled light shining through, and I knew we must be close. The turnoff to The Fox Project was easy to miss; the small white sign pointing to Broadwater Forest Animal Hospital hung low and behind an overgrown stand of brushy greenery. As we drove up the pebbled driveway, I noticed a couple of rabbits in the flowered field to the left and three black sheep in a pasture to the right. They look up half-curiously for a few seconds as we parked. The Fox Project is located at the back of the newly built facility. The organization is a small non-profit that has been in operation since 1991. They have an ambulance service. rehabilitate hurt or orphaned foxes and cubs, and help to educate the public on urban foxes. It was foggy and cool that morning, and I fumbled around looking for some signage. Once I located the main suite I sat on the ground next to the door as I waited nervously for the director to arrive. Soon enough Sandra appeared. She was a fair-skinned blonde with stick-straight hair that hung past her shoulders with perfectly symmetrical bangs. Her glasses reminded me of the ones the girls clad in poodle skirts wore in the 1950s. She was polite and friendly. “Good morning, you must be Amy from the states?” she said with a gentle smile as she unlocked the door. “Yes, hello, you must be Sandra.” I nervously replied as I gathered my things and straightened my coat and scarf. When Sandra opened the door and we walked into the main facility, I was immediately hit with the musky odor of fox, which to me is a special combination of something similar to the smell of skunk and cat urine with a hint of death aroma thrown in for good measure. The odor does have a purpose though. Near the base of all canids’ tails is a scent gland called the supracaudal, or violet, gland. On wild canids, and even some Northern breeds of domestic dogs' supracaudal glands are inactive, whereas wild canids’ glands are very much active and purposeful. They secrete a musky odor from the gland when startled or excited, and also use it to mark territory and “talk” to other foxes and canines. Also, like cats, foxes have a very strong urine that is hard to remove from porous services once it has soaked into the fibers. Adding to that, foxes like to urinate on just about everything, including things they like, things they don’t like, things they want to claim as their own, etc. Scent glands and urine are definitely a couple of the main reasons we don’t see many inside pet foxes in the UK. 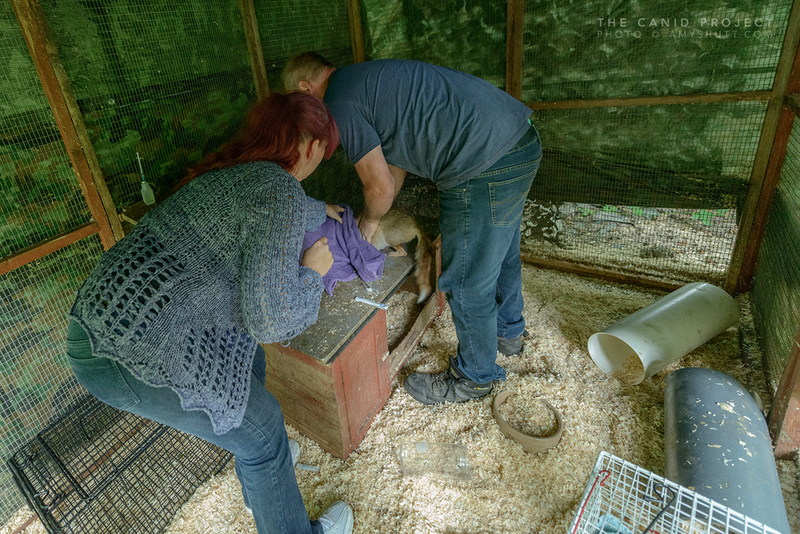 After getting accustomed to the musky fox odor, I put my things in Sandra’s small office and listened as she explained, “The first thing we do is get the kennels cleaned, then feed, water, and medicate the foxes.” She wasted no time, and we got right to work. 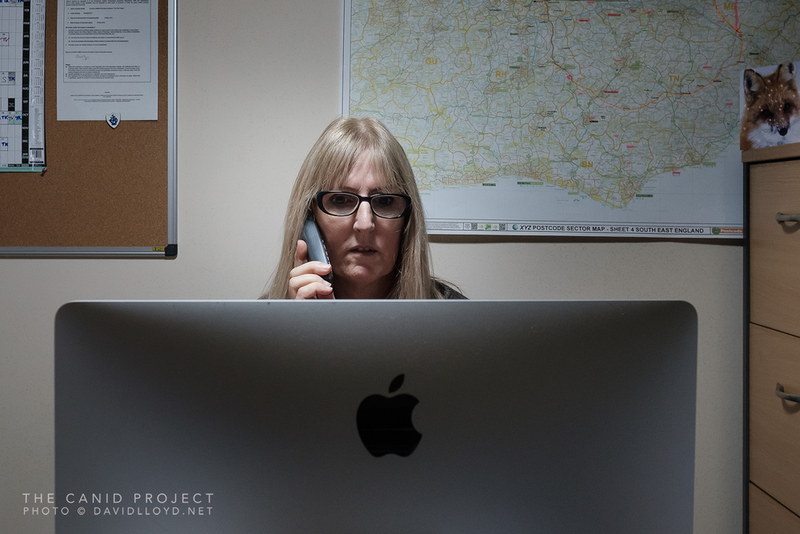 Sandra has been working with the project for over a decade. She spoke fondly of the project and the people involved, “When we are able to bring foxes through their trauma or disease and get them back to their respective home territories it warms the cockles of our hearts! Thanks to the fox-loving public in England, of which there are many, alerting us to emergencies we are able to give something back to the natural world and make a real difference to over 700 individual foxes per year”. Sandra began her work with animals in boarding kennels some years ago. 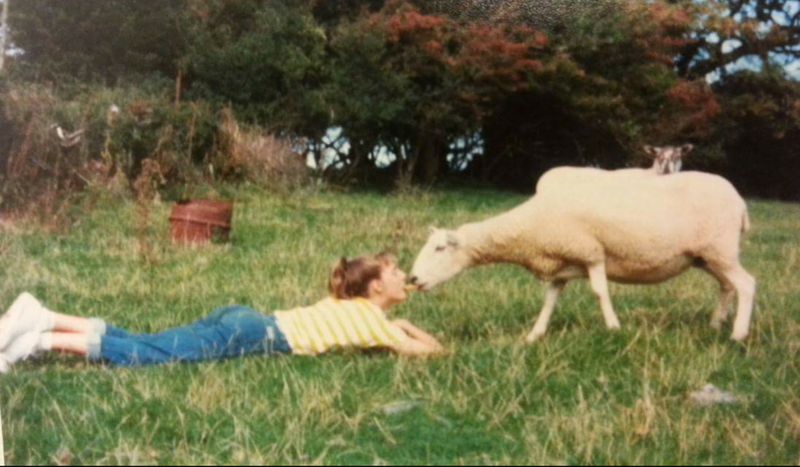 Later she worked for Animal Aid as part of a team campaigning against animal cruelty and promoting a cruelty-free lifestyle. Now, as director of The Fox Project her compassion for animals was apparent as she dealt with the foxes that morning. She had a gentle touch and a calming effect on them and they seemed to trust her. As we continued cleaning and feeding, I noticed there were a few adult foxes in, most with cases of mange, and one with a dog bite. They all sat curled up in the corner of their stainless steel kennels with different degrees of fear in their eyes. I noticed immediately the difference in the eyes of the UK Red Foxes compared to our American Red Foxes. These foxes had a different color to their eyes, a more tangerine gold, and a rounder shape. I noticed also that their snouts were stouter and their heads rounder, less delicate looking, than the Red Foxes of America. These opposing characteristics were subtle, but most definitely apparent. It was once thought that North America's Red Fox population was largely due to the introduction of European Red Foxes in the 17th century. History told us that they were brought over to hunt more than 200 years ago, and therefore they were not totally native to this country. However, a recent genetic study by Statham in 2012 showed that the expansion of Red Foxes in North America after the European fox introductions was actually the result of the dispersal of native foxes southward from Canada. The genetics also showed an absence of European fox haplotypes (a group of genes within an organism that was inherited together from a single parent) in any North American populations. This may have had a bit to do with the differences I was seeing, but I later realized there was probably more to it than that -- the reason our American Red Foxes are daintier and more gracile than the stockier and more robustly built UK Red Foxes. One hypothesis I have discussed with my evolutionary biologist husband as to why the North American subspecies of Red Fox have smaller heads, jaws, and overall more petite frames than the UK Red Fox is that in Europe there is no equivalent to the Coyote; in Europe the two top canids are the Red Fox and Gray Wolf. In contrast, in North America, we have an intermediate-size canid, the Coyote, which undoubtedly overlaps in diet with Red Fox. Therefore, perhaps our Red Foxes are smaller due to competition with the Coyote, leading to smaller Red Foxes here to reduce competition for prey. In other words, the presence of the Coyote may have forced (through natural selection) our Red Foxes to be smaller for specialization on smaller prey items, like mice and birds. In the UK, they are the largest predator and have no competition with a canid of larger size, allowing them to eat prey of any size, small and large. Back at The Fox Project, these bulkier Red Foxes that I helped Sandra feed on my first morning were getting a diet quite unlike their ancient ancestors, but it was probably pretty typical for an urban Red Fox of London: a few dead chicks and dog food. Sometimes to stimulate their appetite, a sweet cake might be thrown in as well. Most of the foxes roused to the smell of the chicks and the pungent odor of the dog food. A couple cleared their bowl in a matter of moments, a few others ate half, then cached a couple chicks in their bedding for later-as I soon found out upon the cleaning of the kennels. My week at the project was not just to feed, water, and clean the kennels of the foxes in care. Nevertheless, as crazy as it may sound, I probably would cross the pond from the USA to the UK to do just those things, I had a larger idea in mind. I had emailed Sandra several months before inquiring about a week of volunteering doing, yes, those menial things that must get done twice daily, but to also document The Fox Project’s efforts. I wanted to help them and I wanted to learn. Sandra agreed to my offer and suggested I help with feeding, cleaning, administering medicines, and assisting the ambulance driver, while I documented and took pictures. At the time, I didn’t realize we were talking about 12 hour shifts from 9am to 9pm. I didn’t mind the 12-hour shifts that week; it was just not what I had expected initially. But I’ve had a growing fascination with foxes since 2007 and now, here I was, in 2016 in England working with and documenting one of the most well-known Red Fox welfare groups in the world. And so when one of the days turned into a 14-hour shift, I didn’t even notice. Feed and medicate foxes, clean fox kennels, take calls, into the ambulance to drop food and give shots to the fosterers’ cub foxes, pick up the LUSH order for the fundraiser, another call, go across town to capture a fox hit by a car with a broken back, bring fox to vet to be put down, put a trap out to catch a mangy fox in a garden, pick up a caught fox for mange treatment .... rinse and repeat. The days were fast and active and wildly different depending on the ambulance driver, the calls we received, the rescues we went on, and the errands we had to run. It was perfect for someone like me, someone who suffers quite literally from a bit of an attention deficit disorder. I also immensely enjoyed hearing the stories of the ambulance drivers. I soon realized that once you ask a question about something someone is passionate about, they tend to carry on in the best way possible. The stories that often followed my leading questions were priceless, fascinating, and something I hold close to me as a special gift I was endowed. My first day out in the ambulance was with ­­­­Tara Kenward, “Taz” to her friends. She walked in for her shift about 20 minutes after I arrived that first day. Taz had long straight hair dyed a tamer Manic Panic burgundy, pulled back messily into a ponytail, with pieces of bangs and baby hairs falling about her forehead and framing her face and her glittery green eye-shadowed eyes that were big and doe-like. She was wearing appropriate clothing for a day of fox work: jeans, tennis shoes, a t-shirt and a hoodie. Taz was 43 at the time, but looked a lot younger. She was friendly with a soft sweet smile and was immediately keen to show me how to go about the chores of the day, never making me feel silly for asking novice questions. I remember thinking immediately that she was a natural teacher and trainer, and an excellent one at that. Throughout the two days I assisted as an ambulance volunteer with Taz she told me many stories of what brought her to this line of work. 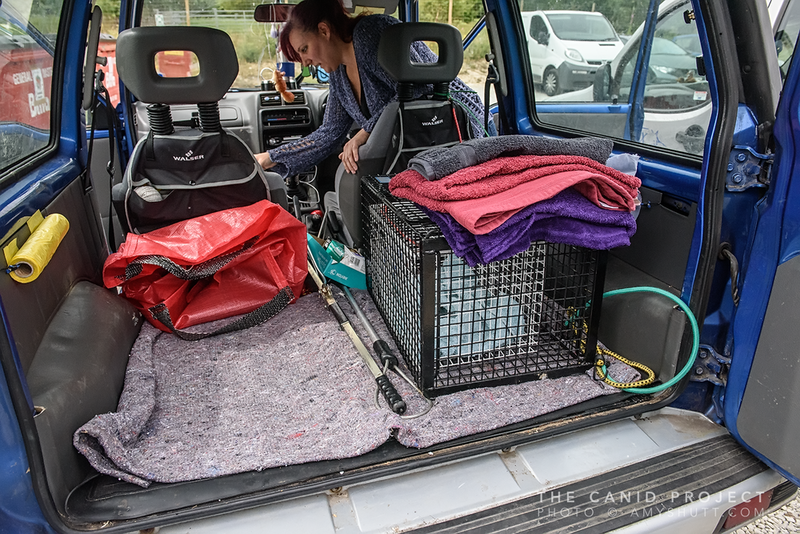 She had been involved with The Fox Project for over three years, starting when she found an injured fox cub under her van. She caught the cub without any hesitation and immediately headed to The Fox Project. Unfortunately, by the time they arrived the cub had already died from internal injuries, likely from a car impact. After the experience, Taz began volunteering at The Fox Project. and after a month of training she became an official volunteer rescuer and ambulance assistant. In fall 2016 Taz became a full-time employee for the organization as an ambulance driver. The project has a large fosterer program. People of the community offer their garden and their time, and the project will set up a modular pen for a group of orphaned cubs. 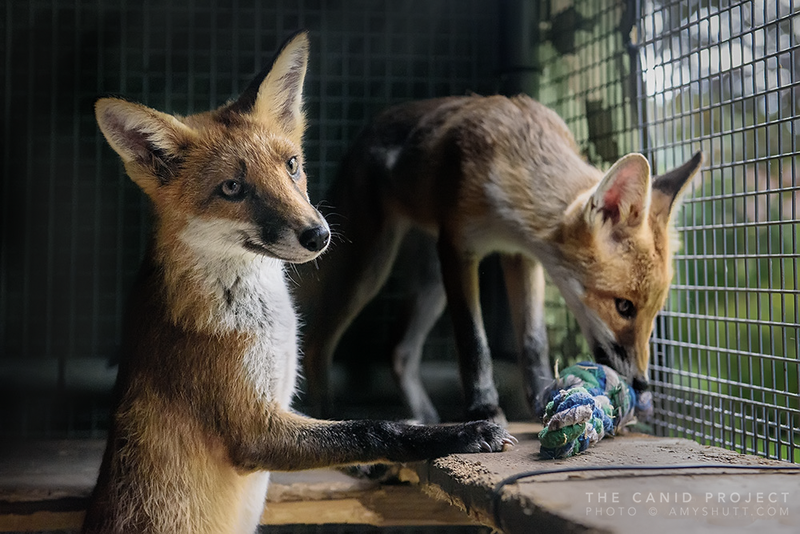 The Fox Project provides the food and will ultimately release the cubs when they are ready, but in the meantime the fosterers feed, water, and monitor the cubs. It’s a brilliant idea, and I love how it is a community effort. Many of the fosterers I met had been working with the organization for several years, one woman had been a fosterer for the project for 21 years. As of this past year there are 30 active fosterers in the system. As we drove from fosterer to fosterer that day to deliver food and give the cubs their weekly shots and dewormer, Taz told me of her childhood home in Bromley, Kent. She described it as the perfect area for a budding animal lover to observe wildlife, as they had a long back garden that met the edge of a wooded area. Hedgehogs, squirrels, birds, and foxes were frequent visitors to her garden, and though she loved them all, she was most captivated by the foxes. “My father built me a hide in the backyard out of an old caravan!” she giddily recalled. He did so on the edge of the yard within viewing distance of the British Rail railway line, which was the corridor through which the foxes entered the garden. Through her caravan hide Taz could observe without startling the fox visitors. She spent many many hours of fox watching from that hide and learned quite a lot about fox behavior from those early observations. As a teenager, her animal passion was fueled even more by way of a local woman who cared for sick and injured wild birds. Taz began helping her to rehabilitate and release the birds back into the wild. She realized then that she had a true affinity for helping and healing animals; this aspect has always been a core part of her personality and her life. 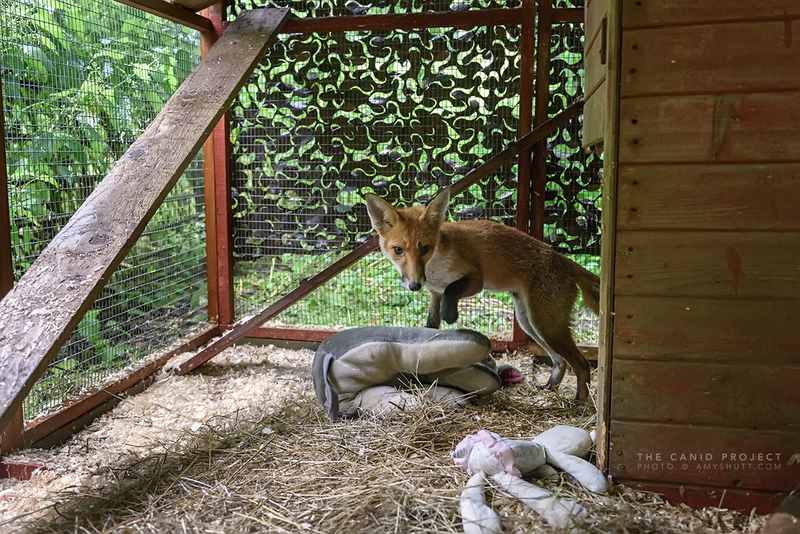 As Taz pulled the ambulance up to a small animal rescue based at a woman's country home in Kent, I saw a fox in the field right beyond an old wooden fence. Taz got out and gathered her things to administer the shots to the cubs that were staying here in a cub pen. I stayed back for a minute to try to get some photos of the wild fox, although all I had was my wide-angle lens with me. He ran away, stopped, looked at me…ran away, stopped, looked at me, and continued to do so until he was just a speck in the back of a dimly lit shroud of trees. Goats and horses were scattered about the pastures nearby, and I heard meows in the distance. As I walked quickly to catch up with Taz, I noticed the sources of the meows; there were many cats at this rescue, in pens and free-roaming . A few were friendly and ran under my feet nearly tripping me as I walked down the narrow pathway next to pens of bunnies, guinea pigs, and finally the fox cubs. Taz was just starting with the four cubs inside. The cubs were getting ready for release in the coming fall and were being medicated to provide a healthy start in their new wild life. They also had had limited contact with people and were "wilding" up quite well. The cubs need to maintain a healthy fear of humans to stay safe once released. The protocol for administering the medicine usually goes quickly and easily. One begins by opening a carrier and getting her towel ready to capture the first cub. A towel is gently thrown over the face of a cub to "blind" them long enough for the handler to scruff them behind the neck. At this point they are immobilized enough and can be given the shot and dewormer. On this day the first fox was quite feisty however, and as Taz attempted to capture him, he jumped from the top of his perch five feet into the air directly at me! When you only have a millisecond to process the fact that a fast, scared, and maybe a little miffed, rusty red ball of teeth, claws, and fur is headed your way all you can do is cover your head and try to turn your face away. Bam! He got me! Bouncing off of me he disappeared quickly inside the hutch, and Taz was able to finally secure him. I looked down towards my right hand and saw a flash of red … red blood, and then the pain set in. He got me all right. After our feisty friend was treated, Taz gently put him in the carrier and went through the same process with the remaining three foxes. When she was finally done with the shots, she released them all back into the pen at one time. I watched them scatter but was distracted and fascinated by the massive cut on the top of my hand that was bleeding and throbbing in pain, courtesy of the fox's claw. 'Battle scar' I whispered to myself. And even through the pain, I know I had a tiny smile on my face looking down at my fox "badge", which is still a faint little scar eight months later, as I write this. I hope it never disappears. As we left this fosterer's house that day, Taz told me a bit more about her experiences in animal rescue. "Before I started with the fox project, my husband Steve and I began a hen rescue project called Fresh Start for Hens", she remarked as we backed out of the animal rescue driveway passing some chickens and goats on the grounds. She explained that the goal was to find new homes for commercial hens to give them a longer, happier post-egg-laying life. "We just contacted small farms, big farms, commercial farms and asked if they'd give us their chickens that would otherwise be put down once they stop laying eggs as often.” she said with a smile. Under Taz and Steve, Fresh Start for Hens expanded, and in February 2015, the couple passed the reigns to their loyal volunteers to focus on their own new goals. During their five-year tenure Fresh Start For Hens saved and homed over 30,000 hens. Now, Taz spends her days with The Fox Project as a full time member of the staff. 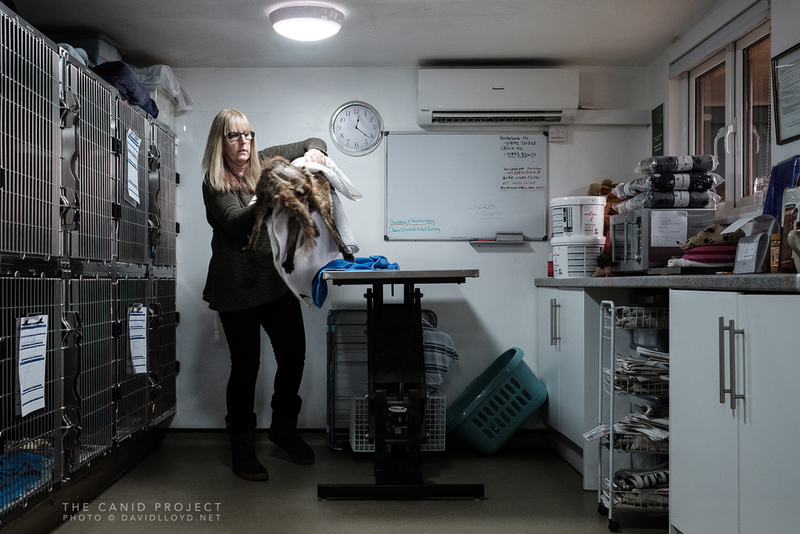 Along with her duties as an ambulance driver, she is also responsible for responding to phone calls to the Project, for caring for rescued foxes, and for catching particularly tricky foxes. "Until cub season, the daily routine is fairly slow," Taz said, "but once the fox cubs start popping up, the workload explodes." When I asked Taz what she thought the most important thing for the public to know about foxes, she responded, "Foxes are an integral part of our ecosystem. They keep rat and mouse numbers down in towns and countryside alike. Without foxes, I believe we'd be overrun with rodents. Be sensible with your waste -- use a bin with a secure lid to prevent the foxes and cats from ripping them apart. Love the foxes." The Fox Project is dedicated to helping foxes and working to remove the stigma around them, and Taz perfectly embodies that theme. My first day with The Fox Project was beyond my expectations. I was quite simply in love with the project, the foxes, the people, and this wonderful place called Kent.